I didn’t carve a single pumpkin this year, and I’m ok with that. It always seems like a fun thing to do, but 10 minutes in, and you’re faced with a whole stringy, seedy mess and I very quickly lose interest. I really love pumpkin, but after Halloween we seem to transition so quickly from pumpkin-spice-everything into full on festive frenzy, that I always seem to miss it and never manage to fully enjoy all of the pumpkin delights. I was so jealous of friends and family celebrating Thanksgiving a few weeks ago with a plethora of pumpkin pie, that I decided to revisit a pumpkin spice cake that I made for the first time a couple of years ago. In a way, the texture and flavours of this cake are quite similar to a carrot cake - I’ve even added walnuts to it a couple of times, which are a nice, crunchy addition. 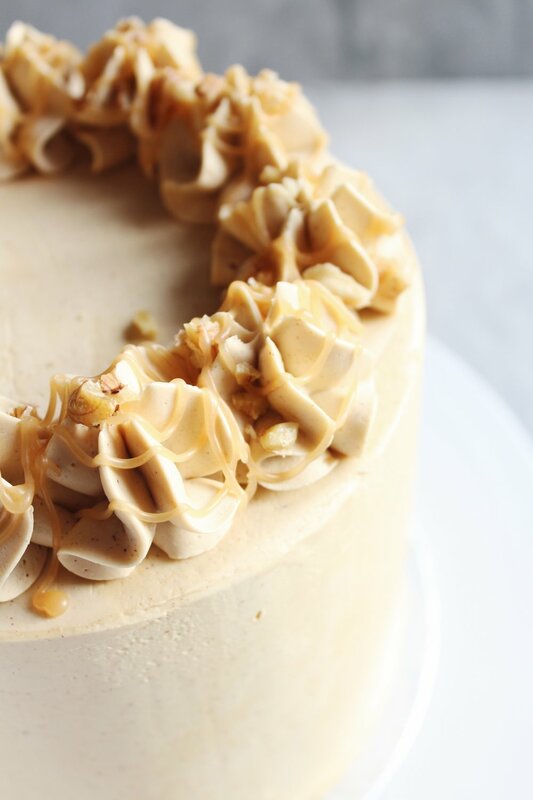 However, it’s the maple caramel that really takes this cake to another indulgent level - it’s very comforting on a chilly afternoon with a cup of tea. The spiced Swiss meringue is very light too, which helps to balance the dense pumpkin sponge. Pumpkin is not just for Halloween... this cake is definitely one that can see you straight through ‘til Christmas!